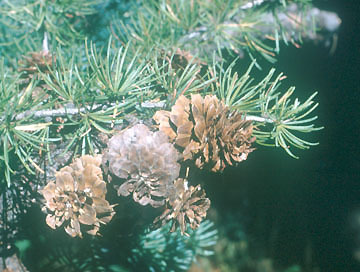 Douglas-fir (Pseudotsuga menziesii var. glauca), ponderosa pine (Pinus ponderosa), grand fir (Abies grandis), western hemlock (Tsuga heterophylla), western redcedar (Thuja plicata), and western white pine (Pinus monticola), Engelmann spruce (Picea engelmannii), subalpine fir (Abies lasiocarpa), lodgepole pine (Pinus contorta), and mountain hemlock (Tsuga mertensiana)(2). Collect cones, separate seeds, plant seeds. Out plant seedlings after one year. (1). (2). Burns, R. and B. Honkala 1990. Silvics of North America, Volume 2, Hardwoods. Agricultural Handbook 654. U.S. Department of Agriculture, Forest Service, Washington, D. C..